Book Week Scotland takes place every year during November and is organised by Scottish Book Trust. Events are held across the country to share and enjoy books and reading. During Book Week Scotland, First Minister Nicola Sturgeon announced every public library in Scotland will receive a complete collection of Muriel Spark novels. 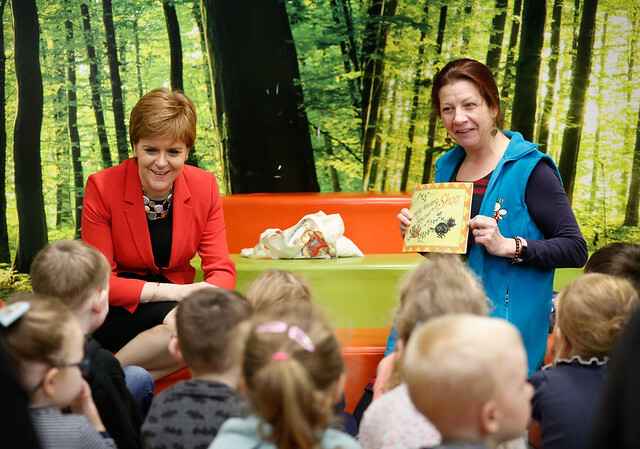 The announcement was made at Loanhead Public Library where the First Minister met a reading club and took part in a Bookbug session. During Book Week Scotland, the First Minister was also invited to Bridge of Allan Primary School to open their new Literacy Lounge. It was a privilege to join pupils, parents and staff at the opening of the new Literacy Lounge at Bridge of Allan Primary School. It is a fantastic resource for the school and everyone involved in the project, especially the children who have played a big part in the design of the space, should be proud of their work. As the week came to an end, the First Minister joined author Maggie O’Farrell for a Q&A at Stirling Castle to discuss their favourite books.